So guys the time has come! 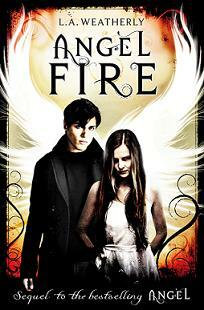 Angel Fire is about to be released on October 1st in the UK and the blog tour starts that day too! but before all that Usborne have been kind enough to give us an exclusive extract from Angel Fire to celebrate all the exciting things that are starting for Angel Fire (release,blog tour etc) Make sure you hit up all the blogs on the dates because there is some exciting stuff to be shown. So here it is guys the exclusive never before scene from Willows persepective. It involves a new special character that everyone is dying to find out about more. I was standing at the top of a high tower, gazing out at what had to be the largest city in the world. It was endless, like something from a science-fiction film. Low mountains crouched on the horizon in every direction; the city crept over them and kept right on going, fading into hazy infinity. Somehow I knew this was in Mexico – and that it was where Alex and I were meant to be. My heart tightened with urgency as I stared at the sea of buildings. We had to come here. We had to. The world whirled and shifted; the crowd scene disappeared. Now twelve angels hovered over the city, brighter than any I’d ever seen – like twelve blazing suns that poured light over the concrete buildings below. An ancient, ruthless power connected the twelve; I shuddered as I felt it. The angels started to glow even brighter still, burning my eyes until I had to duck my head away. As I did, they vanished in an explosion that was sensation rather than sound – a shock wave that howled past, knocking me off my feet. I landed with a bump. Silence, so still and perfect, like cut glass. I was in a park, in my human form again. Soft green grass; palm trees mixed with poplars and cypresses. The twelve angels were gone…but I wasn’t alone. A boy stood watching me. He was a little older than me, about the same height as Alex, with brown hair that fell in loose curls. A glint of stubble; high cheekbones and strong features – a beautiful face that I knew had been through great pain, yet it held such humour and tenderness that it twisted my heart. We stared at each other. I had no idea who the boy was, but the thought of ever being without him filled me with despair. The unexpected feeling robbed the breath from my throat, so that at first I couldn’t speak. “Who are you?” I whispered at last. In answer, the boy stretched out his hand. “Come, querida,” he said softly. His eyes were urging me to say yes, and part of me wanted to link my fingers through his so badly that it hurt. No, I’m in love with Alex, I thought. And then: But, oh my god, to not be with you – how could I possibly bear it? OHH wasn't that so good? a love traingle? who is this new guy?!? We will just have to wait and see!